Sharing information on project development tools and technologies with local and tribal audiences is the goal of a new outreach effort by the Federal Highway Administration. As part of the Every Day Counts initiative, FHWA and its state divisions are partnering with Local and Tribal Technical Assistance Programs to host a Web conference series called EDC Exchanges. In the exchanges, participants interact with both Webinar presenters and local, state and FHWA experts who facilitate discussion and answer questions geared to the local level. Two states, Massachusetts and Oklahoma, report that providing other technical presentations and facilitating live interaction with experts make the exchange program omore beneficial to audiences. The first EDC Exchange centered on the construction manager–general contractor project delivery method, which involves the contractor early in the construction process. In Massachusetts, LTAP officials were concerned about potential attendance because the state is just beginning to use CM/GC, so they scheduled experts to make presentations on two other Every Day Counts technologies, warm-mix asphalt and the Safety EdgeTM. Municipal representatives at the session expressed interest in using warm-mix asphalt and the Safety EdgeTM, according to Chris Ahmadjian, program manager for the Baystate Roads program, the state’s LTAP center. "The Massachusetts Department of Transportation people didn’t realize the local demand for those technologies," he said. "In one community, the local asphalt plant had already converted to producing only warm-mix." As a result, the state agency will host classes through the LTAP center on new municipal specifications for warm-mix asphalt, the Safety EdgeTM, volumetric mix design for asphalt and a new asphalt overlay with maximum 9.5-millimeter aggregate, said Ahmadjian. "I, for one, didn’t realize there was such a communications gap between the municipals and the state people. The EDC Exchange made good things happen!" The Oklahoma LTAP and TTAP Centers enhanced the EDC Exchange experience for participants by adding live presentations and interaction with experts. More than 50 people attended the CM/GC Exchange in Oklahoma, said Ivan Marrero, assistant division administrator of FHWA’s Oklahoma Division. "We set up a morning training session with speakers from the Oklahoma DOT, our division office, industry experts and even some college professors," said Marrero. "The morning sessions focused on pavement construction and maintenance. We think that brought in more people to the event." The next two EDC Exchange topics were geosynthetic reinforced soil-integrated bridge system technology and right-of-way acquisition. Instead of using conventional bridge support technology, GRS-IBS technology employs alternating layers of compacted granular fill material and sheets of geotextile fabric reinforcement to support bridge abutments. GRS is a rapid construction method that eliminates the need for heavy equipment and costs 25 to 60 percent less. About 70 people attended the GRS-IBS Exchange, said Jim Self, director of the Oklahoma TTAP at Oklahoma State University. "Our LTAP, especially Michael Hinkston, has taken the lead on this," he said. "We had people from various tribes and mostly county people. We also had the heads of several tribal road departments and people from the Bureau of Indian Affairs and the U.S. Army Corps of Engineers." As well, Self reported good attendance for the Flexibilities in Right-of-Way EDC Exchange, which focused on ways to expedite right-of-way acquisition. "What the LTAP and the TTAP provided are the local people to do the presentations and the invitations to get people in the seats," said Self. "We contacted everybody, and FHWA’s division office provided the actual EDC Exchange part of it, where we are connected to the network. "We determined right away that getting people to a central location for a two-hour seminar was not going to go too well," said Self. "But if we brought them for a training session that lasted a little bit longer and went into more depth, we would have a better audience." An EDC Exchange was planned for August 16 on adaptive signal control technologies, which enable traffic signals to adapt to the volume of traffic on a given roadway. The Innovator newsletter is changing. Published in the past by the Highways for LIFE program, it’s now part of the Federal Highway Administration’s new Center for Accelerating Innovation and will expand its coverage of how innovation is being used to improve the American highway system. The Center for Accelerating Innovation houses both Every Day Counts—an initiative to deploy innovation aimed at shortening project delivery time, enhancing roadway safety and protecting the environment—and Highways for LIFE—an initiative to accelerate innovation use to build roads faster, better, more safely and with less congestion. "Accelerating widespread use of innovation is critical to improving the nation’s highways and keeping America moving in the 21st century," said Hari Kalla, director of the Center for Accelerating Innovation. "Bringing the Every Day Counts and Highways for LIFE initiatives under one umbrella will allow FHWA’s ongoing efforts to encourage innovation use to have an even more significant impact. The Innovator newsletter helps us tell the innovation story and provide useful information to our stakeholders throughout the highway community." Since its launch five years ago, Innovator has brought readers information on how states are using performance goals and proven but little-used innovations to achieve better results on construction projects, how teams are applying marketing approaches to deploy innovations faster, and how private industry is partnering with public agencies to try promising innovations in real-world settings. In future issues, you’ll see more articles on methods to deliver projects to the public faster, proven technologies that can improve safety and reduce congestion, and success stories on states and localities that are using innovation. As always, the newsletter will include links to additional information and resources to help readers learn more about the technologies and processes featured. "Input from readers is important to the success of Innovator, so we encourage them to let us know what they think and how we can make the newsletter more useful to them," said Kathleen Bergeron, marketing and communication coordinator for the Center for Accelerating Innovation. "We also love to hear from readers who have article ideas or would like to see a particular topic covered." For more information on Every Day Counts, contact a state FHWA Division or visit the initiative’s website at www.fhwa.dot.gov/innovation/everydaycounts. Send comments and article ideas to Julie.Zirlin@dot.gov. Pavement recycling is saving the Virginia Department of Transportation time and money as it rehabilitates aging roadways. The agency rebuilt a section of Interstate 81 in Augusta County by recycling existing road material and using it in the new pavement structure. Using this paving method cut construction time by about two-thirds and saved millions of dollars on the project, earning the transportation agency a national award from the asphalt recycling industry. The Virginia DOT used innovative pavement recycling methods to rehabilitate part of Interstate 81 faster and at less cost than conventional construction. "Using these pavement recycling methods has the potential to revolutionize how we rehabilitate our aging roads, both in Virginia and nationally," said Virginia Governor Bob McDonnell. "We expect to continue using these processes, where appropriate, to save money and materials as we rebuild older roads throughout the commonwealth." During the 2012 paving season, the Virginia DOT plans to use cold in-place recycling to rebuild a section of U.S. 17 in Isle of Wight County. The I-81 project marked the first time cold in-place recycling, cold central-plant recycling and full-depth reclamation were used together on an interstate project in the United States, although other states have used the techniques separately. The $7.6 million project involved rehabilitating a 3.7-mile (5.9-kilometer), two-lane section of southbound I-81 near Staunton, a process that took about eight months for contractor Lanford Brothers Co., Inc. of Roanoke, Va., to complete. Using conventional pavement construction would have cost about $40 million, the Virginia DOT estimated, and taken about two years. The agency would have had to widen the southbound lanes, including bridges, to allow two-lane traffic during the reconstruction. On this stretch of I-81, the right lane required full-depth reclamation—from the asphalt driving surface down through the foundation—because it had suffered more extensive damage from heavy traffic loads than the left lane. The asphalt layer under the driving surface was restored using cold central-plant recycling, in which stockpiled milled asphalt from the road was processed in an on-site mobile plant for reuse under a new hot-mix asphalt overlay. Because damage to the left lane was less severe, it needed work only on the surface and underlying asphalt layers. Cold in-place recycling was used in which a machine pulverized the asphalt layer on the road, then strengthened and recompacted the reconstituted materials on top of the foundation before a new asphalt overlay was put down. "Savings on the I-81 in-place pavement recycling project go beyond time, money and materials," said Virginia DOT Commissioner Greg Whirley. "It saved fuel because it reduced the need to transport as much new and old materials. It increased safety for drivers and road workers on the project because it reduced work zone congestion. This section of rebuilt pavement also will be stronger from bottom to top, extending its service life and reducing the need for such complex maintenance for many years." The I-81 project also used a novel traffic management plan. While one lane on I-81 was under construction, large trucks traveled on the other lane and cars were detoured onto U.S. 11 away from the construction. The Virginia DOT used on-road, Web-based and other communication tools to alert motorists about the construction. For the project, the Virginia DOT won the 2012 Recycling Award in the Cold In-Place Category from the Asphalt Recycling & Reclaiming Association and Roads & Bridges magazine. Winners were selected based on the amount of recycled pavement materials used, cost savings and project challenges. Jim McMinimee, former chief engineer and director of project development for the Utah Department of Transportation, died May 10 in Washington, D.C., of natural causes. McMinimee, 51, was known nationally for his pioneering work on accelerated bridge construction techniques and the construction manager–general contractor project delivery method. Most recently, McMinimee served as implementation manager for the second Strategic Highway Research Program for the American Association of State Highway and Transportation Officials. He also worked as a consultant on the Federal Highway Administration’s Highways for LIFE and Every Day Counts initiatives. A civil engineering graduate of the University of Utah, McMinimee spent 25 years with the Utah DOT, achieving leadership roles in maintenance, operations and project development. Engineering News-Record magazine named him a Top Newsmaker in 2008. "Jim was an incredible ally for FHWA in our efforts to advance innovation for both the Highways for LIFE and Every Day Counts programs," said Byron Lord, senior advisor at the FHWA Center for Accelerating Innovation. "He had a real passion for making a difference. When he saw a better way, he pursued it. He will be missed, but he will not be forgotten." Conducting audits to enhance road user safety is gaining traction across the country: Sixteen states now have formal road safety audit programs, 34 states have made audits part of their Highway Safety Improvement Program, and cities and counties have also adopted the technique. A Federal Highway Administration Web conference, part of the free "Innovation" series sponsored by Highways for LIFE and the National Highway Institute, explored how two states and a county implement audit recommendations. Road safety audits are part of the Highways for LIFE Vanguard Technology initiative, which is designed to accelerate the widespread adoption of high-payoff innovations to benefit road users. Aimed at reducing traffic injuries and fatalities, road safety audits examine existing or future road segments or intersections to identify safety issues, said Craig Allred of FHWA’s Resource Center, who moderated the Web conference. A team of experts reviews the site in question, analyzes the findings and documents recommended safety improvements. "The key is that road safety audits use independent, multidisciplinary teams that provide a fresh perspective," Allred said. "Bringing in areas all across the board—law enforcement, maintenance, planning, design, engineering—creates teams that really work." Road safety audits use multidisciplinary teams to identify safety issues on existing and planned roads and recommend improvements. Since its initial training on the technique in 2004, the Massachusetts Department of Transportation has conducted more than 100 road safety audits and made them a necessary step for federal Highway Safety Improvement Program funding eligibility, said Bonnie Polin of the Massachusetts DOT. In Massachusetts, audits focus on lane-departure and cross-median crash locations and high-crash intersections. After conducting audits, teams have five business days to prepare a draft report and another five days to get participant feedback before reports are posted on the Massachusetts DOT website. "This was a lesson learned for us," said Polin. "Initially, the reports were taking a year to 18 months to prepare." Audits have resulted in modifications to project plans and helped decision makers prioritize projects, Polin said. In many cases, they have produced low-cost solutions to safety problems, such as a $200 sign at a high-crash intersection where conflicting lane markings and lane-use signs confused drivers. William Haynes of the Montgomery County Department of Transportation in Maryland discussed the role of road safety audits in the county’s Pedestrian Safety Initiative. The county conducts audits of areas with high numbers of pedestrian-related crashes. Recommended improvements range from some that can be done in a month to others that may take two years or more. "Our first step is identifying low-hanging fruit, such as trimming foliage and repairing broken traffic signal push-buttons. They can give you a pretty good bang for your buck," said Haynes "The benefit is that there are usually existing maintenance programs that can help us get things done quickly." Long-term projects can become short-term priorities, Haynes said, so have safety documentation ready to seize immediate opportunities. Partnering with other agencies and departments can extend the funding available to complete projects, he added. Peter Hsu of the Florida Department of Transportation demonstrated the database the agency developed to create, track and organize road safety audit reports. The database contains road safety audit recommendations that can be searched by several factors, such as implementation status and location. A sample is available at http://safety.fhwa.dot.gov/rsa/sampledb/. 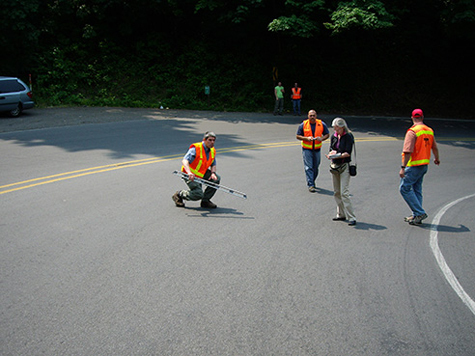 Road safety audit resources are available at http://safety.fhwa.dot.gov/rsa/resources. 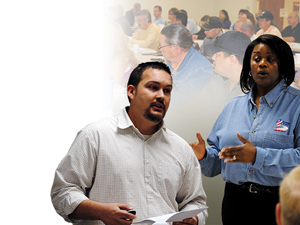 Details on the National Highway Institute’s "Road Safety Audits/Assessments" training course are at www.nhi.fhwa.dot.gov. FHWA offers guidance on technical issues through its free Road Safety Audit Peer-to-Peer program. Assistance can be requested by phone at (866) P2P–FHWA, by e-mail at safetyp2p@dot.gov or online at https://rspcb.safety.fhwa.dot.gov/p2p/p2p_app.aspx. To view a recording of the Road Safety Audit Web conference and register for future "Innovation" sessions, go to www.fhwa.dot.gov/hfl/resources/#webinar. Travelers felt the impact for just 10 days when the South Carolina Department of Transportation used accelerated construction techniques to rehabilitate a historic movable bridge linking the mainland to Sullivan’s Island over the Intracoastal Waterway. 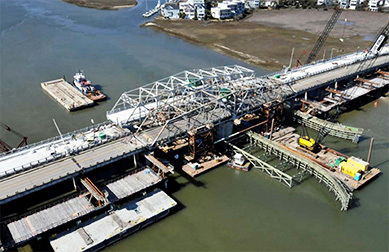 Using traditional construction would have stretched the bridge closure to eight months, according to a Federal Highway Administration report, Rapid Removal and Replacement of the SC 703 Ben Sawyer Bridge Over the Intracoastal Waterway in Charleston County. The South Carolina DOT was awarded a waiver of the state match incentive under the Highways for LIFE program to demonstrate the use of innovation to get the job done with minimal traffic disruption. To limit bridge closure time on a South Carolina project, the new swing span was built off-site and moved to the bridge site on a barge. The project, designed to preserve the appearance and characteristics of the existing structure to meet community wishes, involved keeping the original substructure and alignment and replacing the deteriorated superstructure and mechanical and electrical components during a short bridge closure. 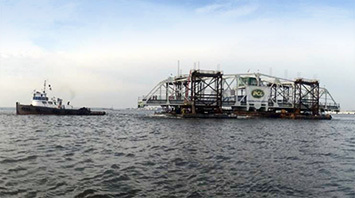 Crews assembled the swing span away from the construction zone, loaded it on barges and floated it to the site. Taking advantage of changing tides, crews raised the existing swing span off the pivot pier and lowered the new one into place. New approach spans were built next to the structure on temporary foundations and installed using a hydraulic sliding system. The result was a 96 percent reduction in the time traffic was impacted compared to traditional construction methods, far exceeding the Highways for LIFE performance goal of a 50 percent reduction. The project also met Highways for LIFE safety goals. Modular construction off-site and next to the existing bridge plus closure of the bridge during superstructure replacement eliminated the need for motorists to travel through a potentially hazardous work zone, resulting in a work zone crash rate of zero. No worker injuries were reported during construction. The project increased the width of travel lanes from 10 to 14 feet (3 to 4.2 meters) and the sidewalk from 2.5 to 5.5 feet (0.7 to 1.6 meters), which is expected to enhance safety for motorcyclists, bicyclists and pedestrians in the future. Smoothness and sound intensity data collected before and after the project indicated that the ride quality improved, although the post-construction measurements did not meet Highways for LIFE goals. Smoothness of the approach and swing spans improved an average 51 percent, while sound intensity, or tire-pavement noise, decreased by several decibels. The new superstructure (back) was slid into place after the old one (front) was moved onto temporary supports. An economic analysis found that using innovation on the project netted $1.7 million in savings. Accelerated bridge construction techniques added $4.8 million to building costs, but drastically shortening the time vehicles were detoured saved $6.5 million in vehicle operating and delay costs. "SCDOT’s innovative approach was successful in delivering a quality product quickly, safely and with less interruption to the public compared to traditional methods," the report noted. "The use of modular construction and a hydraulic sliding system to set portions of the bridge in position allowed SCDOT to minimize the duration of traffic detours, saving time and money." To read the South Carolina report and other technical reports on Highways for LIFE demonstration projects, go to www.fhwa.dot.gov/hfl/projects. A video on the Highways for LIFE website shows how the automated pavement marker placement system works. New videos on the Highways for LIFE website feature projects funded through Technology Partnerships, the Federal Highway Administration program that helps industry develop promising prototypes into market-ready products that can improve highway quality or safety or reduce congestion. The Asphalt Binder Cracking Device provides a simple, reliable method to test the cracking potential at different temperatures of the binders used in asphalt. 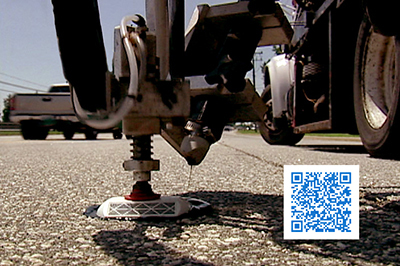 The Aggregate Image Measurement System captures real-time digital images of paving material samples, analyzes aggregate characteristics that affect pavement quality and improves the speed and accuracy of testing. The Intelligent Asphalt Compaction Analyzer is a quality control tool that can estimate the density of an asphalt pavement continuously in real time during construction. The automated pavement marker placement system allows safer, quicker installation of reflective pavement markers. Precast full-depth ultra-high-performance concrete waffle bridge panels provide greater durability because of high strength, low permeability and improved connection details. The bridge bent system for seismic regions allows the main elements of bridge bents to be prefabricated off-site and assembled on-site, cutting construction time and traffic delays. A demonstration paving project in Vermont will feature not just one, but three innovative technologies: warm-mix asphalt, intelligent compaction of the asphalt and the Safety EdgeTM, which is already standard practice in Vermont. Both warm-mix asphalt and the Safety EdgeTM are technologies being deployed across the country through Every Day Counts, the Federal Highway Administration’s initiative to deploy innovations that shorten project delivery, improve safety and protect the environment. 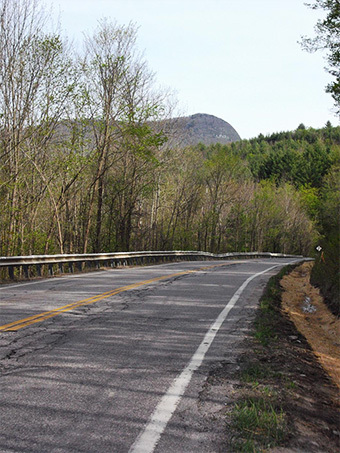 The project, which received a grant from FHWA’s Highways for LIFE initiative to accelerate innovation use, involves milling and resurfacing the asphalt on 11.3 miles (18.1 kilometers) of U.S. 4A and Vermont 30 near Castleton. Peckham Road Corp. of Garden, N.Y., won a $3.9 million contract to resurface three sections of the two highways, both two-lane roads. A Vermont highway resurfacing project will use warm-mix asphalt, which reduces fuel use and produces fewer fumes than hot-mix asphalt. Warm-mix asphalt is just beginning to see use in Vermont, said Mark Richter, materials and construction engineer for FHWA’s Vermont Division. Warm-mix asphalt is produced at temperatures 50 to 75 degrees Fahrenheit (10 to 23.8 degrees Celsius) lower than hot-mix asphalt. Its benefits include less fuel use, reduced smoke and fumes during production and paving—which helps the paving crew—and increased ease of workability and compaction. "Presently, Vermont’s specifications allow the use of warm-mix, but contractors generally have not made the investment in their plants to convert to warm-mix," said Richter. The state believes that the industry is best suited to determine what the best production method is." Warm-mix asphalt is produced two ways: by putting an additive in the liquid asphalt cement or by injecting the hot liquid asphalt with a tiny amount of water. On the Vermont project, three asphalt mixtures will be used: warm-mix with a wax additive, warm-mix by the foam process and conventional hot-mix. "We will have a side-by-side comparison of the ease of compactability, the overall ride quality of warm-mix, workers’ satisfaction with it, the performance of the mixtures and the length of time to put traffic back on the roadway," said Richter. "We have a specification that tells us how cool the asphalt must be before we put traffic on it." Asphalt rollers equipped with intelligent compaction technology are used as quality control tools. With some intelligent compaction systems, a display screen in the equipment operator’s compartment shows real-time asphalt mat temperature, roller coverage of the mat and some indication of mat stiffness. 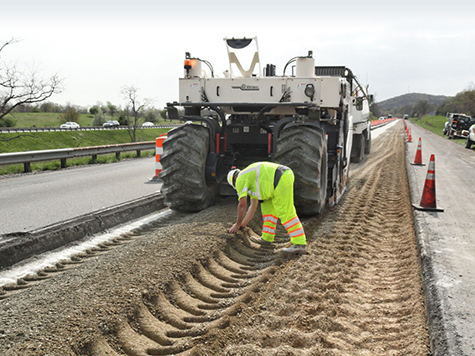 For the Vermont project, the roadway will be milled to a depth of 2 inches (5 centimeters), a thin leveling course of asphalt will be applied, and the intelligent compaction roller will roll over the surface to get mat stiffness readings. After the paver lays down the new 2-inch mat, the roller will once again measure mat stiffness. "The roller will be able to show the improvement in pavement structure that is made as a result of the new asphalt," Richter said. The intelligent compaction rollers are equipped with Global Positioning Systems technology that indicates where a roller is working and where it has been. The intelligent compaction display screen shows a color-coded band to indicate whether one, two or three passes have been made in a certain stretch of roadway. "The idea is to demonstrate that you may not be getting the coverage you think you are getting," said Richter. "But with this computer monitor, we can show that you are getting the coverage that you want. IC technology is not being used for contract acceptance of the new mat; it is to be used for a contractor’s quality control." The Safety EdgeTM, which many states are trying on paving projects to mitigate pavement edge drop-off, has been used in Vermont for some time. The Safety EdgeTM is created by a paver attachment that forms a 30- to 35-degree taper from the top of the pavement to the graded shoulder. On roads where roadway departure crashes can occur, the Safety EdgeTM can save lives because it enables drivers who drift off the edge to return to the roadway more easily. To learn more about warm-mix asphalt, go to www.fhwa.dot.gov/innovation/everydaycounts/edc-1/wma.cfm. For more information on the Safety EdgeTM, see www.fhwa.dot.gov/innovation/everydaycounts/edc-1/safetyedge.cfm.